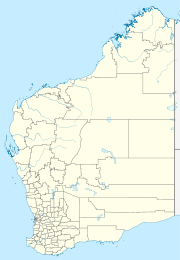 Gutha is a townsite in the Mid West region of Western Australia, 32 kilometres (20 mi) north of Morawa. In 1913 it was decided to establish a train station there, on the Wongan Hills – Mullewa railway. The district surveyor suggested the name "Muthingutha", the Aboriginal name of a nearby rockhole. This was shortened to Gutha by the Lands Department, and Gutha siding was established in 1913. It was gazetted as a townsite in 1914. ^ Western Australian Land Information Authority. "History of country town names – G". Retrieved 2 October 2008. ^ "CBH receival sites" (PDF). 2011. Archived from the original (PDF) on 18 March 2012. Retrieved 1 April 2013. This page was last edited on 26 October 2017, at 12:56 (UTC).